Henwen is one of my favorite Celtic Goddesses. The Great White Sow wandered from Annwn, the Underworld, into this world, giving birth to wheat, barley and bees, as well as wolf cubs, ferocious cats and eagles wherever she went. And this is how she brought life to the world. Other stories tell that it was prophesied that whatever Henwen birthed would bring harm to Britain and so King Arthur tried to catch her. Her swineherd was Coll Ap Collfrewi, one of the great swine herders of Britain, and he hung onto her bristles wherever she went. She escaped into the sea, but returned to the land and gave birth to her strange litters there. Arthur never did catch her and it is assumed that the Great Sow still wanders Britain, bringing fertility and prosperity wherever she goes. In this version , Henwen will also read your fortune for you with rods and runes. 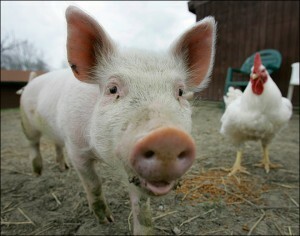 Pigs often symbolize our relationship with the Underworld. This is the time of the year where the veil thins between the worlds because of the harvest. This is when the final harvest is brought in and the last animals are slaughtered for winter. All of the spirits passing from our world to the Underworld open the boundaries and allow us easier access to those who have gone before. It also makes it easier for those who are making their transition from this world to the next more to slip away, which is often a blessing. It can be a time of great grief and blood, it can also be a time of joyous celebration and gratefulness for another bountiful year. Henwen is an excellent goddess to honor for this turning of the Wheel! She is also a goddess you can easily share with your children. If you have a group of kids, you can do a really easy children’s ritual from the story of Henwen. Sit all the children down and have them braid wheat straw. (You can find a tutorial here). If your children are too small for this, you can do this beforehand; just make sure there is a wheat braid for every child. Take everyone somewhere outside where there is plenty of room to run around. Have everyone stand in a Circle. If you want to call Quarters at this point and cast a Circle you can, but you might simply want to acknowledge each direction. Tell the children the story of Henwen and explain that she brought a good harvest to the world. Have them hold their wheat braids and go around the Circle having everyone ask for something for the upcoming year. Have them focus their energy for their wish onto the wheat braid. (This would also be a good time to talk about the Harvest and why it’s important to how we live and what we are celebrating. Let them know that they things they should be wishing for should not be material, but things to help their community). Give the children picked to be Henwen and Coll Ap Collfrewi the bags with the wheat braids in them. The rest of the children will be chasing them. The other children are It and the goal of the game is that each child must catch Henwen and Coll, who have to stay together the whole time. (This is a giant game of tag in reverse). When Arthur or one of his knights “catches” Henwen and Coll, Henwen or Coll should give them one of the wheat braids and give them their blessing for the year. That child can now return to the starting point. When everyone has caught Henwen and Coll, Henwen and Coll can return together to the rest of the group. When everyone is together again, have Henwen and Coll announce that their wanderings are done for the year and that they are ready to enjoy the bounty of the Harvest. At this point, have everyone celebrate together with a snack, after closing whatever Circle you started with. A good snack would be wheat toast with butter and honey. Each child can take their wheat braid home with them. If you’re having an adult ritual later, you could also have the children “visit” all together with their wheat braids to offer the luck of the wheat braids for that ritual. Have them present their wheat braids with well wishes for the blessing of the Priest and Priestess. Blessed Samhain all! Have fun! Samhain: During this time of year, some people celebrate the Lady’s return to the Underworld. Others remember their ancestors and give thanks and blessings to those who have come before us. Still others celebrate the end of the Harvest. Samhain is a time of diverse celebrations and remembrances. 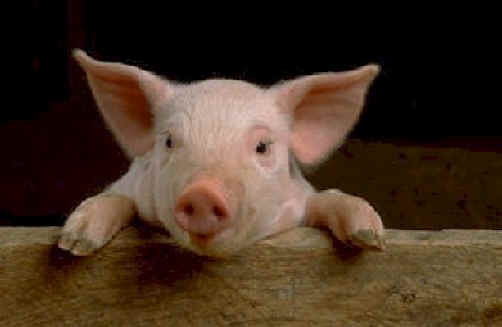 I, however, think about pigs. Once upon a time, a king was hunting in the forest. As he was mustering his own pack of dogs, he heard a strange pack of dogs baying. As he and his dogs came to a clearing in the woods, he finally caught sight of the other pack of dogs. These dogs were white with red ears and they were chasing a white stag. (This should have been his first hint that this was no ordinary pack of dogs). 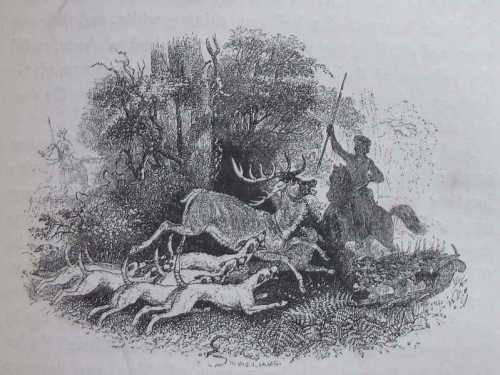 The strange pack of dogs brought down the stag and the King, whose name was Pwyll, had his dogs drive them off so that he could claim the prize of the stag for his own pack. As his dogs fed, another Huntsman appeared in the clearing. Pwyll, King of Dyfed, greeted the stranger, but the stranger refused to introduce himself because of a great discourtesy Pwyll had done him. When Pwyll asked what discourtesy he had given, the Stranger answered. ‘I’ve never seen a greater discourtesy by a man than driving off a pack which has killed a stag, and [then] feeding your own dogs on it. It’s never wise to upset the God of the Underworld, and Pwyll realizes too late who he has offended. Arawn asks Pwyll for a service to restore his honor. Pwyll happily does the service asked of him, and this begins a great friendship between the Kingdom of Dyfed and the Kingdom of Annwn. Pwyll himself received many gifts from Arawn, the most important of which is Pwyll’ s wife, the goddess Rhiannon, which is another story entirely. (If you want to read the whole story, you can find it here). But the greatest gift the Kings of Dyfed receive from Arawn is a herd of swine. This story comes to us from the first Branch of the Mabinogion. Throughout the Mabinogion, the ownership of the pigs is an important issue. Whoever owns the pigs has a close and friendly relationship with the Underworld, which brings them both prosperity and happiness. We see sacred pigs in many stories throughout European mythology. The pig was sacred to Demeter, a goddess that is an important part of the Greek Underworld story of Persephone and Hades. This spilled over onto the Roman goddess Ceres as well. 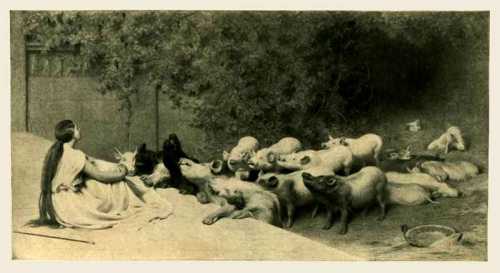 Sacred pigs were herded into caves for the goddesses in both lands. While most people agree that Zeus was suckled by a goat, some say he was suckled by a sow. Circe turned Odysseus’s men into swine on his journey returning from Troy. 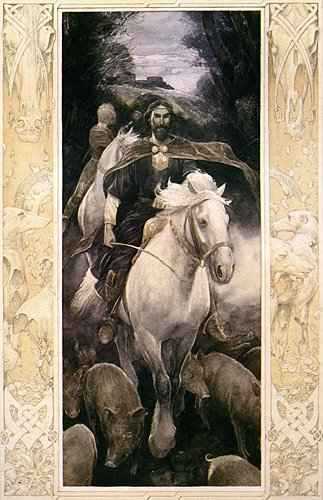 The great goddess Cerridwen was known as “The Old White Sow” and the Irish god of the sea, Manannan had a magical herd of pigs. The Russian witch/goddess Baba Yaga is also often thought by some to ride a Sow through the forest instead of the flying mortar. In Norse mythology, the boar is a symbol of Odin, and the Valkyries serve the warriors who feast in Valhalla from the boar Saehrimnir. Pigs still tie us to the Underworld, which is why I always “sacrifice” a pig on Samhain. This is a reminder to me and to the Gods of the relationship that we have with the Underworld. 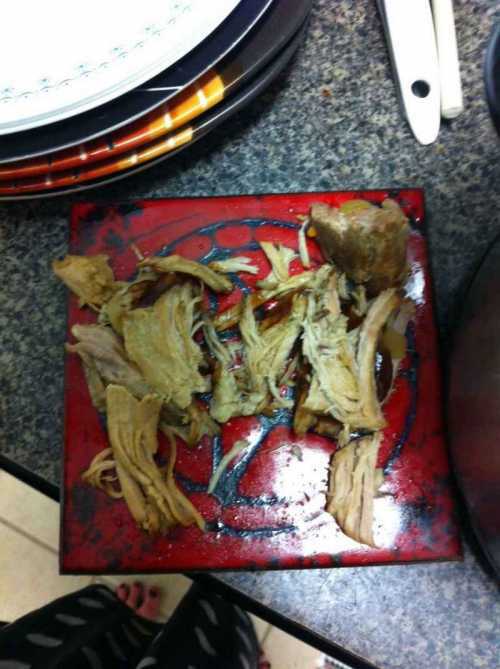 While most of us can’t actually sacrifice a pig, I make a delicious pork dishes and leave them out as offerings to stand in as a replacement for a living swine. So while you’re enjoying your Samhain festivities this year, whatever they may be, remember the pigs! They may sound like an odd creature to appreciate, but they are an important tie to the Underworld that can bring your home health, wealth and prosperity. *I wrote a children’s Henwen ritual for Samhain over at The Pagan Household. If you’re interested, you can find it here!